Let’s go help Linda in the library. Help me read these books. I think there might be some important details here. Read through all of the books set out on the table for you. I have underlined the important clues. It was a foggy and cold winter morning. Jon Jarl’s ships have been in dire straits for weeks. There is not enough food or fresh water left on board. The food stores were next to completely empty and the crew near death but they did not want to let their Jarl down. Jon was convinced that they would find an undiscovered land out here in the ocean. God has shown hi a vision of the land and those visions were coming more often as time went by. Was Jon crazy? Or would he prove once and for all he was right? The crew was loyal and true and would follow him anywhere. In the same moment, a crewman was thinking of jumping overboard to end his starvation, something happened. The fog opened before the ship to reveal rising cliffs above the waters. Land ho! Land ho! We’ve spotted land! It turned out Jon was right. Again. The first ship unfortunately never found out, as the large rocks that would later be called Tower Cliffs, tore out the bottom of the ship. All hands aboard were lost. Jarl’s ship and the rest of the group turned away when they saw the fate of the first ship and they instead landed at a calmer beach down the coast a long way south of the Tower Cliffs. There Jon first put his armored foot on the shore and climbed up a fifty-foot cliff, which would later be the site of their first fort, and shouted into the night: I a Jon Jarl, son of Jor! This land is now my land an will be called Jorvik and I will defend it with my life as long as I live and with my soul when I am dead! I was very impressed by the giant statue that has been erected here. The old fort is watched over by the huge statue of the former Governor Gareth. With only a cannonball and a boat hook he defended Jorvik against the continental pirates. Without his bravery, Jorvik would have been lost. This is the reason for the statue. The location was a natural choice, when Jon Jarl landed in 1218 and built Jorvik’s first fort. Governor Gareth modernized the old fort in the 1600s using the most up-to-date defense construction techniques. Gareth was proud of the fact that his ancestors had traveled with Columbus on his first transatlantic voyage in 1492 and therefore named the fort after the famous sister ship of the Santa Maria. During the extensive renovations it is said that Gareth found a number of very interesting artifacts in the walls of the old fort. It is also legend that Gareth still watches over a very unique artifact himself from beyond the grave. The artifact apparently has something to do with the sun. “The funeral of Jon Jarl was held on a bleak autumn day in the year 1263. During the last forty-five years since Jon had ruled Jorvik, and had never left since the day he first claimed the island as his own. He fought hard for many years but was viewed as a just and popular ruler who tried hard to unite the many small kingdoms that emerged on the island. Anyone who stood against Jon would face a very dangerous enemy. Well, everyone knows of his exploits and the history books explain it well. The funeral was a huge even with many guests representing nearly all the clans of Jorvik. One clan in particular was the Silfer Clan of Jon’s descendants who still make their home in Silverglade today. Even the local druids attended who had a good relationship with Jon Jarl. The funeral lasted three days and was followed by a month of official mourning and peace on Jorvik. The actual burial was in a crypt not far from the Tower Cliffs where the first of his ships had sunk when he had discovered Jorvik. From there he could eternally watch over his mighty castle to the south. When you are done reading the books, speak with Linda. I don’t get it. Do you? If you think you know what we are looking for, have a look and see if you can find it. 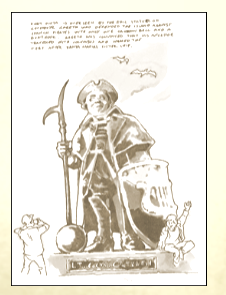 All of the clues point to the Sun Key being located at the statue in Fort Pinta. Let’s go there and see what we can find. Objectives: Take the object from the hidden compartment and see if it can be used to open the blocked opening in Jarl’s Crypt. Go into Jarl’s Crypt, north of Fort Pinta, and try to use the Sun Key on the first door. When you open the door, go into the next room of the crypt. Are you afraid of ghosts? I am Jon Jarl, son of Jor and forever guardian of Jorvik and its protectors from beyond the grave! Who is it that tries to open the first portal to my final resting place? Objectives: Tell Jon Jarl who you are. Rita? Hmmm… I’ve never heard of you… But I guess many years have passed since I began my eternal rest. I may help you but first you must convince me of who you really are what you truly stand for. So you want the fragment of Aideen’s Light? I can give it to you if you convince me you are worth and have your heart in the right place. If I am satisfied with your answers I will give you a true fragment of Aideen’s Light. Objectives: Answer Jon Jarl’s questions. Pass Jarl’s test to get the fragment of Aideen’s Light. Honorable Rita, I understand now that you are a true supporter of the Keepers of Aideen. I will meet you and give you the fragment as you act in the name of the druids. Know that the power of the fragment has not been activated, but the druids know what needs to be done. I have rested for nearly eight hundred years and until now I have not awoken from my final peace. I don’t feel I will participate in this final battle to protect Jorvik on the dangerous day. Aideen hasn’t yet called for me. Farewell Rita. I return now to my final rest until the moment I am called. Give Fripp my regards! Objectives: Ride with the fragment to Elizabeth, tell her what happened, and ask her how to activate the fragment. Take the fragment to Valedale, and speak with Elizabeth. But now we need to figure out how to activate the fragment so you can use it. I think you can charge and activate this fragment. After all, you have proven that you have special skills… Borrow my rune staff, ride up to the rune stones in the hills by my house and put the fragment in front of the sun stone and then charge it by activating the stone with the rod. Come back to me when you’re done. I’m sure it will work. The sun’s life giving light will give the fragment the properties we need now. Objectives: Place the fragment by the sun’s rune stone and activate it with the rune staff. Ride up behind Elizabeth’s house, and go to the rune stone with the sun pattern on it. Place the fragment on the ground in front of the stone, the use the staff to activate the fragment. When you are done, take both back down to Elizabeth. Hmm, before you head off and expose yourself to danger in Scarecrow Hill, I think you should test that it works first. Do a test here and show me, so we can see that it works. I will see how powerful the light is and can determine whether it is good enough. 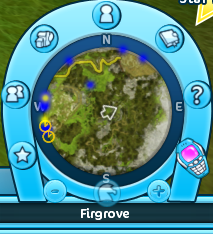 Objectives: To activate the fragment, click the button above your mini map. -Pulls out shades- Click the button on the side of your screen, above your mini map, to activate the fragment. Well, Rita. All that remains is to hope that the light will protect you against the magic that chained the scarecrows to the borderlands between our world and the unreal. But be on your guard. When forces like these are unleashed, they can unfortunately attract vicious shadow figures. No smoke without fire. No light without shadow. The stronger the light, the sharper the shadow. We better you’re lucky and avoid that… Be careful. Good luck now! Don’t forget to activate the fragment when you’re at the gate to Scarecrow Hill! If you get hold of the apple, ride to Alex who is still waiting for you at the Northern Iron Gate. Objectives: Activate the fragment when you are Scarecrow Hill gate. The button is disabled until you’re there. Find a golden apple at the top of the hill. Go to Scarecrow Hill, and once you are at the gates, you will be prompted to activate the fragment. Once activated, run to the top of the hill, obliterating any magic scarecrows along the way. When you get to the top, grab the golden apple from the tree. “You pick the apple! At the same time, something strange happens… What’s that?! A group of flying shadow witches show up, probably sent to stop you! They have materialized in the shadow of the strong light of the fragment. They intend to take the apple from you. Objectives: Escape the shadow witches and don’t get hit by the sleep bombs! Bring the apple to Alex at the Northern Iron Gate when you get away from them. This quest is hard. Have patience, as it will probably take you a couple of tries to complete it. Watch out for the marks on the ground, indicating where the sleep bombs will land. Adjust your speed to run past the circles before the bombs hit, or slow to let the bomb hit before moving through. Once you get some distance from Scarecrow Hill, the witches will stop pursuing you and you can continue running to the North Iron Gate. Speak with Alex there. Rita! Summerblaze! You look upset! What happened? And what’s that? A golden apple! You and your wonderful Summerblaze are truly heroes! What a terrible story with the witches who were chasing you. Lucky that you got away, that could have ended very badly. When such immense power like Aideen’s Light is released, sharp shadows are cast into the magical unreality. I think the shadow witches materialized in the shadow of the holy light – as a kind of counterweight… Scary. But at least we have the apple!Now we have to see if the legend is correct and that evil witches can’t resist the apple if they’re offered it by a pure soul. Go ahead Rita, try making the witch Pi nice again so she can tell us what we want to know. Objectives: Ride to Pi and give her the golden apple. Go past the North Iron Gate and into the witch’s swamp. You can find her still by her house to offer her the golden apple. You again! Aren’t you tired of being a frog? Okay… Then I’ll enchant you again, but this time you’ll remain a frog forever so you can hop around in my swamp croaking and signing for me in the evenings. Huh? What? You’ve got goodies? But what’s this? An apple? Oh no! The golden apple! The one I can’t eat! But it looks so delicious… Don’t eat! But, ooohh, it looks sooo good! It’s probably so very good. Thank you for giving me the apple and made me good again! It can’t have been easy. I did everything I could stop anyone from picking the apple. But what misery I have done during my time as a wicked witch! And Klaus, my poor husband! He must have missed me. Now there is much to do to restore order… You say that there’s one thing I can tell you that will help make things right again? Okay, ask away. Giving you answers is the least I can do. Objectives: Ask Pi about Justin’s horse and what she knows. Get the answers you need from Pi. Anyway, I would make sure that the converted horse would be delivered to the docks at Moorland’s south shore for transport to Dark Core’s headquarters, which is located on a secret oil rig somewhere out at sea. Hm, what day is it? Okay, I would deliver the horse tomorrow, that’s right. To the dock behind Moorland Stables. That’s what was agreed. I’m so sorry for everything I’ve done and now I’ll begin the work of making things right again. I should start by helping Justin’s horse back to its normal self again. Now take care, Rita. I hope my information was helpful. Ride to your friend Alex so you can make the necessary plans. Thanks again for freeing me from the wicked witchcraft. Ride back out of the swamp and meet Alex by the North Iron Gate. Wow, it worked?! She was willing to talk now? You or I have to get there and pretend to be the supplier of the distorted Dark Horse tomorrow and make sure to board the transport. Once we’re on the oil platform we can hopefully find out what happened to Justin and perhaps save him! Do you dare accept such a dangerous mission? Or should I and Tin-Can do it? You accept the mission? You’re really brave and I don’t doubt your ability. You and Summerblaze have truly shown that you’re a bold and clever team. You know a captain who owes you a favor? Smart. Talk to him, maybe he can follow the barge from a distance and come to your rescue or take you away from there if needed. Talk to your friend Captain Brus. I’ll do some errands meanwhile and rest up a bit. I’ll see you later at the small dock on Moorland’s south shore, just behind the stable. I’ll hide there and keep watch. Objectives: Ask Captain Brus to help with the escape route. Ride down to Cape West Fishing Village and speak with Captain Brus at his place along Longbridge. Arrrh! If I’m ready to sail? Well, Rita, I’ve never been more ready than now. I got rid of the darn termites. They went biting, so to speak. The mast contains so many metal parts that they got tooth ace and gave up their destructive chewing. If I can help a girl in need? By all the mermaids of the sea, of course I’ll help you! I owe you and I can never say no to an adventure at sea! I’ll follow you when the transport takes you to the secret oil rig. Here, take this distress flair. Fire it when you want me to pick you up or if you need help. I’ll pick you up at the same place where I see you board the rig. Under cover of the thick backs of the morning fog, I’ll secretly hide along the southern coast of Moorland. You won’t see us, but I promise that we’ll be out there. With me at the help, you can sneak up on anyone! See you tomorrow! Good luck with your mission! Now ride to your friend and make up the final details of your plan. And remember, even though you won’t see my ship, I’ll be out there, ready to rescue you. Objectives: Make up the final details of the plan with Alex who now scouts the dock behind Moorland Stables. Ride to Moorland, and meet with Alex. She’s standing in view of the beach, behind the stables, near Mrs Holdsworth’s house. Shhh… Have you seen, Rita, there’s already a creepy Dark Core guy there at the dock. He seems to be waiting for something. But… You could say that your friend Captain Brus is anything but discreet… He just arrived with lots of flare, filling up the whole bay with his ship! I’ll stay here and ensure that you get on your way properly so I can intervene if something unexpected happens. I’ll stay here until you get back from your mission. Hope you can save Justin from his captivity! Don’t be afraid. You have Captain Brus and Summerblaze to help you! See you tomorrow. Prepare for your adventure, be sure that you both are rested and your horse feels great. Speak with the Dark Core guard tomorrow. Let’s go work on our horseshoes again with Conrad. Follow my instructions carefully. Here are my tongs and hammer. Get ready! You know the drill. Speak with Conrad when you are done with your work. It is shaping up well. Now we need the iron to rest overnight. We can continue work tomorrow. Hmm… Seems like the water bucket is nearly empty. The water is running out quicker than I would have imagined. It is steaming off quickly when we are cooling the red-hot horseshoes. That shows that the new shoes are really full of energy… But without water, we can’t continue our work. Can you go back to the source of the Silversong River and collect more water? Here, take my bucket with you and use it. Objectives: Fill Conrad’s bucket at the source of the Silversong River in Valedale. Give the water to Conrad. Go to Valedale and collect the water from the waterfall, then return to Conrad. Great! Now we have enough water to finish our work forging your new horseshoes! Now let’s go see if the Council Man has found anything interesting about our ghost friend.